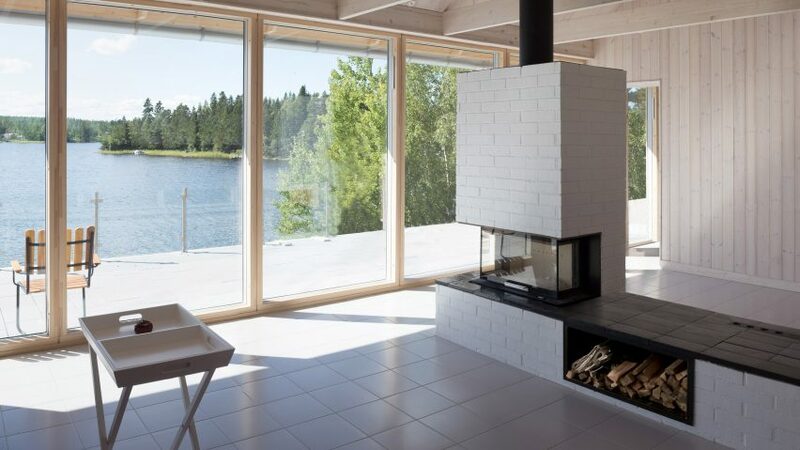 A painted-brick fireplace separates areas for living and dining at this summer house designed by London-based architect Tina Bergman for a plot facing out towards the sea on Sweden's east coast. 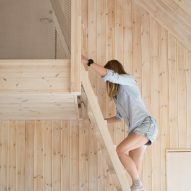 Hus Nilsson is located on the Norrfjärden bay in the northern Swedish archipelago, and occupies a sloping site between the forest and the Baltic Sea. Bergman designed the building to replace a 1950s cabin with basic amenities that had been used predominantly for brief visits as a place to warm up after fishing or skating on the frozen sea. The owners wanted to install a larger property on the site that can be used year round and provides spaces suited to social gatherings, as well as more private areas for various members of the family to escape to. A key objective for the design was achieving a strong connection with the surrounding scenery, through the inclusion of both indoor and outdoor spaces that face the bay and the forest. 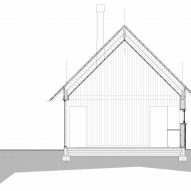 "The new house, a singular long and narrow building volume with a steep pitched roof and closed gables, spans across the site and aims to be the connection between the forest and the water," said Bergman. 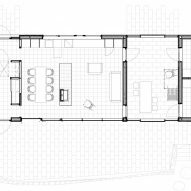 "By its form and its placement on the site, it allows many of its rooms a view of the sea," the architect added. 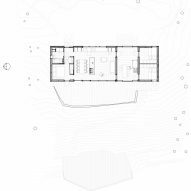 "The placement also affords privacy and prevents the house from feeling overlooked by its neighbours." The internal layout features a central open-plan living space interrupted only by a freestanding fireplace, which provides a focal point that also helps to divide the lounge and dining areas. Bedrooms positioned at either end of the house can be closed off or opened up depending on the amount of privacy required. The central space therefore becomes the only circulation area, which helps to minimise unused space. Glazed internal doors maintain sightlines along the length of the house, while the sliding glass doors on opposite sides of the central space can be opened to create an semi-external passage through the building. "The one commonly featured outdoor room in Nordic private houses is here integrated in the main volume," said Bergman. "By making it an external passage through the house, it not only creates a visual and physical connection between the forest and the sea, it also lifts it from its normal peripheral position to be the nave of the building." The house sits on top of an existing stone retaining wall that forms a plinth for a terrace overlooking the sea. The living areas open onto this outdoor space, from which a set of steps descends to a small jetty. Materials and forms employed throughout the project reflect the severe weather that can affect the region. 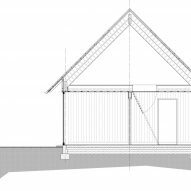 The house's steeply pitched roof prevents excessive snow from building up and its low eaves offer protection from the salty sea winds. 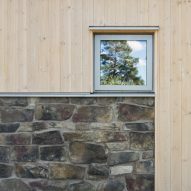 Facades are clad in pine treated with a silicone-based protective coating, which is complemented on the forest side by a rustic stone surface. The house's timber framework supports a glue-laminated wooden roof structure topped with panels of aluminium-zinc coated sheet steel. The simple construction method enabled the building to be erected in just seven months. Photography is by Peter Guthrie.